The modern, millennial-focused home textile company took over Outdoor Voices’ former Knox District space. You’ve probably heard of Parachute from your favorite podcast host, or discovered a dreamy shot of thoughtfully messy linen sheets scrolling on Instagram. The modern bedding brand has done a solid job reaching chain store-averse millennials online and has even established a few brick-and-mortar showrooms on the east and west coasts since launching online in 2014. This weekend, they opened their first non-coastal outpost in Dallas (yay), in the former Outdoor Voices space in Knox District, which means that the airy, Travis Street spot lives on through another trendy, millennial-targeting brand. At least for a little. Much like Outdoor Voices, Parachute’s time on Travis is only temporary—the goal is to get a feel for the market before planting more permanent roots. But, also like Outdoor Voices (whose pop-up remained up from late 2016 to December of 2018), it’s safe to expect Parachute to stay a while. Stop by for California cool linens and Egyptian cotton, fluffy waffle weave robes, and modern, minimalistic (and reasonably affordable) throws, shower curtains, table runners, dog beds, and newly launched all-natural fiber rugs. On a personal note, I recently bought one of Parachute’s down feather beds after checking The Wirecutter for the best mattress topper (and being a run-of-the-mill millennial who likes stuff). It was one of the better decisions I made in 2018. 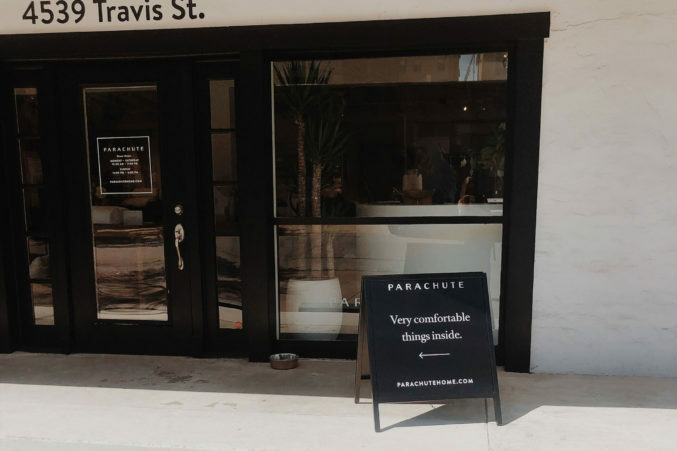 Parachute held their soft opening this Saturday, but they are celebrating the new Dallas store for real next Thursday, March 28, with cocktails, light bites, tunes, and a photobooth from 6 to 9pm.